It could be said with some justification that rollers - are rollers - are rollers! Throughout the industry the hand rolling machine has changed little for a very long time. Though the use of acrylics instead of metal have become common place and the blankets are better grades of man-made materials, combining vinyl, nylon and other such fibers, the basic design has pretty much remained the same. There are so many brands out there, all of suspiciously similar design that to dwell too comprehensively on each and every one of them would be redundant to the point of ill-logic. There have been a few innovations. Some Gizeh rollers have a hatch like lid at the top that swings away during the filling operation and then clamps down when it is time to insert the paper. It seems to make the second (inserting the paper) operation easier. They have followed up similarly in their newly acquired Mascotte line with the same design (at right). 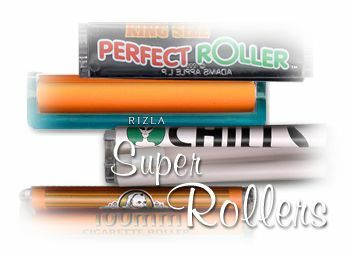 Most rollers are designed for 70 to 78mm papers. This time we take yet another look at what has become our hands down favorite group, the 100+mm roller. Right off, it is necessary to reiterate that you can use any length paper in these machines. In other words you don't have to use King-Size (100mm) papers. Shorter papers work great and you've only to trim the excess tobacco after rolling with the shorter papers. While there are some minor differences in each of the following four large rollers, they share much more in common with one another. They are all made of acrylic and all work superbly. Our favorite, over time, remains the Rizla Blue (at left) mainly because of the amount of texture that the blanket has. This texturing tends to grab the paper more efficiently than smoother blanket materials. All of these roller's blankets have some texture but Rizla is clearly the most textured and the degree of attention to manufacturing tolerances makes this machine one that will last a long, long time. The Chills SuperCone contains a most interesting design innovation which comes in the form of an insert which allows the user to created functionally enhanced cone shaped cigarettes. These cone shapes create an slightly different smoking experience as the larger end which is lit allows the flavor of the tobacco to make itself known more robustly while the tapering keeps the smoke you get at the other end more consistently mild. It also provides sticks that stand out and evoke conversation - mostly - "hey, how'ja do that?" The Zig Zag King Size 100mm is by far the most beautiful roller in this category and the slightly thinner rolling rods allow the user to create some very well made thin cigarettes - a size, by the way, that makes designer manufactured brands like Sherman's the popular choice for those that like to spend money. Like the Rizla, this machine is built to last and the beautiful orange and gold motif is a standout in public. The Perfect Roller shown at left is functional if not pretty. It is often found at the least expensive price and yet is very well made. The blanket is the slickest of the bunch but still has enough texturing to facilitate efficient paper grabbing. The cigarettes you can make with any of these machines are very professional looking as you can see in the graphic at left. As there are many paper possibilities, including some made from tobacco by-products like Republic's Golden Wraps (shown as top stick), hand machine rolling can take on many new dimensions for the enthusiast. You can use filters, available at most smoke shops, to complete the design as shown in the bottom stick. I personally really do use these machine to create very thin cigarettes made from tobaccos that are delicious but much to strong to smoke by themselves in an injector tube. And like the small hand-held injectors, these machines need to be demonstrated to appreciate their functionality. These machines while somewhat larger than the smaller 70-78mm hand rollers are every bit as convenient to lug around and the product they produce we feel is superior in every way. The fact that you can use any size paper is a big plus in our book as we find many folks, especially those in possession of 70mm rollers, inadvertently will return home with 78mm papers which are common but too long for the shorter machines. Gizeh has also introduced a new rolling box under its newly acquired Mascotte brand shown below. It is as beautiful as Gizeh's own and is identical in function, making it our pick over the Rizla Rolling Box. These devices are very attractive though we find their functionality to suffer from a fairly steep learning curve and they have the limitation of 70 mm papers. They do afford the user room for papers and a little tobacco to carry around and they certainly attract attention. Women seem to really like these things and the cosmetics of this latest Mascotte entry are downright stunning. Let us know what you think about rollers. 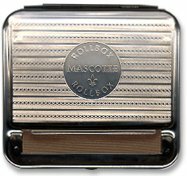 We are, for the most part, injector-heads here at the magazine and would greatly appreciate any tips and experience you have had with any of the wide array of handrollers that are available. Any really unusual ones with an attached .jpg of it (please keep file sizes less than 30k) will likely be used in our next issue. If you have some real "treasures" share them with us and our readers. Contact us by clicking here or go to our Contact page for more information on how to get sample products to the magazine. Until next time - RYO - the ed.